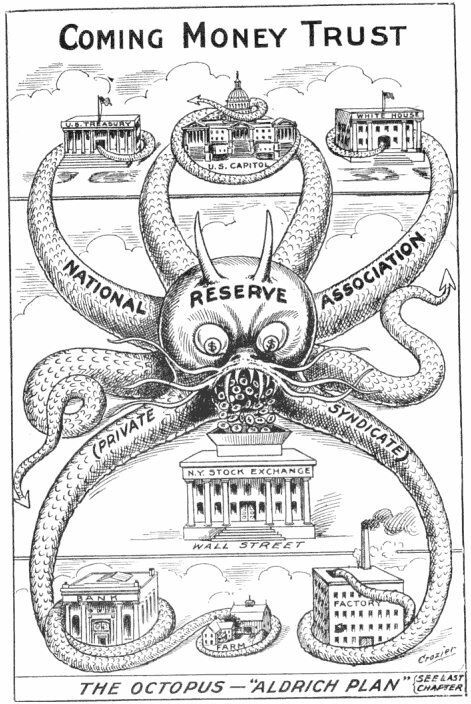 It’s long been clear to some of us in the financial kingdom that a small clique of powerful companies control vast swathes of the global economy. Now that mythos has been given some scientific credibility. The idea that a few bankers control a large chunk of the global economy might not seem like news to New York’s Occupy Wall Street movement and protesters elsewhere (see photo). But the study, by a trio of complex systems theorists at the Swiss Federal Institute of Technology in Zurich, is the first to go beyond ideology to empirically identify such a network of power. It combines the mathematics long used to model natural systems with comprehensive corporate data to map ownership among the world’s transnational corporation. As the world learned in 2008, such networks are unstable. 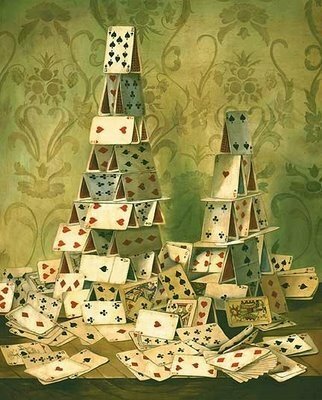 A huge mountain of interlocking, interconnected debt is a house of cards, and a monetary or financial system based upon such a thing is prone to collapse by default-cascade: one weak link in the chain breaks down the entire system. This entry was posted in Current Affairs, Economic History and tagged conspiracy theories, house of cards, macroeconomics, new scientist, reuters, the federal reserve. Bookmark the permalink. Careful Aziz you are playing with fire. A Uni student tried investigationg this a few years ago, and started to shout out the connections. He was put away in a mental institution. This is not me investigating it. This is a Swiss team of academic researchers, published by a mainstream economics journal, and publicised by New Scientist, one of the biggest mainstream science publications in the world. I know that, but you are an Agent for peddling the information. I did not read this in my local paper. It is a different world now. The Elites are scrambling to maintain control. Um, this study doesn’t mean anything until it is actually published and the data and methodology examined. As of right now, this press report is ready fuel for those who already have a predetermined outcome in mind. Based on the report, it sounds like the researchers are using some of the same modeling tools that I have used–it will be interesting to see their methodology and the basis for making their connections. If we think about this for just a little bit, it makes perfect sense that many of these companies are connected–only the biggest are going to use an established player in an area where another has established themselves. Going with a small startup would make absolutely no sense. As to the numbers, they list 147 banks that control 40% of the financial sector. Since the financial sector is only about 30% of the global economy, this works out to those 147 banks controlling 12% of the economy–not a majority, and probably not even a plurality. The point is really the high degree of interconnection. It’s not some conspiracy about control — this study is empirical evidence, for the reality that the system is fundamentally fragile. If one globally interconnected institution becomes insolvent, it can drag the system down with it through the phenomenon of the default cascade, which necessitates government intervention (i.e. bailouts) to stop the system sliding into collapse. We saw that in 2008 — and none of the fragility has been removed from the system. Leverage is up, net derivatives exposures are up, M2 is soaring. The only shock absorber is the high levels of excess reserves. I doubt this is sufficient to prevent another default cascade.